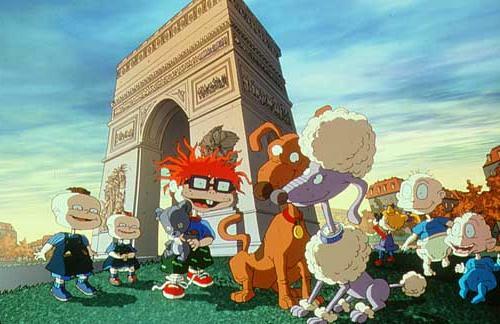 Here's the first picture of the Rugrats from the Rugrats In Paris film. But who's that baby sharing a drink with Chuckie? It's Chuckie's new sister, Kimi Watanabe; she'll become related to him after Chuckie's father, Chazz, marries her mother, Kira, another single parent. 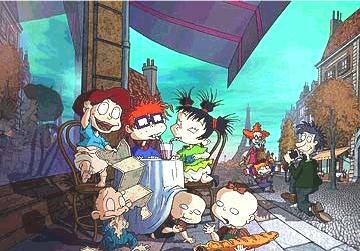 This picture was first revealed on 1/13/2000 on the Angelica Reigns Supreme website; Klasky-Csupo, the producers of the movie, released this copy on their website in September 2000. Here are a couple more pictures from the film. The one from the left, from France 3 television, features Spike's new girlfriend, Fifi. 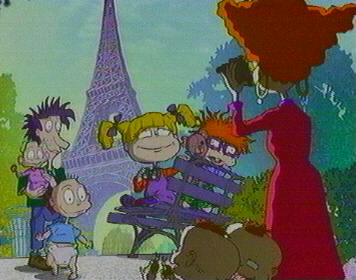 On right, from the movie documentary, features one of many pictures of the Rugrats gang taking pictures of each other.